All editions are beautifully designed and are printed to superior specifications; some include illustrations of historical interest. &&LI&&RBarnes & Noble Classics &&L/I&&Rpulls together a constellation of influences--biographical, historical, and literary--to enrich each reader's understanding of these enduring works.&&L/DIV&&R&&L/DIV&&R&&LP style="MARGIN: 0in 0in 0pt"&&R&&LI&&R&&L/I&&R &&L/P&&R&&LP style="MARGIN: 0in 0in 0pt"&&R&&LI&&RGreat Expectations&&L/I&&R, described by G. K. Chesterton as a "study in human weakness and the slow human surrender," may be called &&LSTRONG&&RCharles Dickens&&L/B&&R's finest moment in a remarkably illustrious literary career.&&LBR&&R&&LBR&&RIn an overgrown churchyard, a grizzled convict springs upon an orphan named Pip. The convict terrifies the young boy and threatens to kill him unless Pip helps further his escape. Later, Pip finds himself in the ruined garden where he meets the bitter and crazy Miss Havisham and her foster child Estella, with whom he immediately falls in love. After a secret benefactor gives him a fortune, Pip moves to London, where he cultivates great expectations for a life which would allow him to discard his impoverished beginnings and socialize with the idle upper class. As Pip struggles to become a gentleman and is tormented endlessly by the beautiful Estella, he slowly learns the truth about himself and his illusions.&&LBR&&R&&LBR&&RWritten in the last decade of his life, &&LI&&RGreat Expectations&&L/I&&R reveals Dickens's dark attitudes toward Victorian society, its inherent class structure, and its materialism. 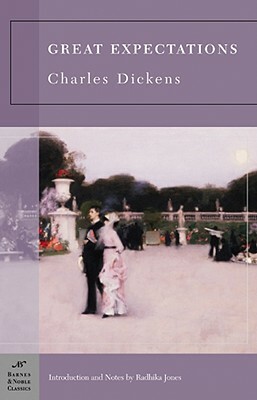 Yet this novel persists as one of Dickens's most popular. Richly comic and immensely readable, &&LI&&RGreat Expectations&&L/I&&R overspills with vividly drawn characters, moral maelstroms, and the sorrow and pity of love.&&L/P&&R&&LP&&R&&LB&&RRadhika Jones&&L/B&&R is a doctoral candidate in English and comparative literature at Columbia University and the managing editor of &&LI&&RGrand Street magazine&&L/I&&R.&&L/P&&R&&L/DIV&&R&&L/B&&R&&L/DIV&&R&&L/B&&R.